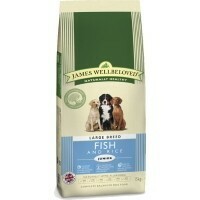 James Wellbeloved Junior Dog Large Breed Fish and Rice is a complete food for adolescent large breed dogs with an adult weight over 25kg. James Wellbeloved have specially selected wholesome, natural ingredients in the Large Breed Junior Kibble range, making it easy to digest and delicious to eat. Made with single meat protein, this tasty food has been blended with linseed, a rich source of the fatty acids that are essential for a glossy, healthy coat. Alfalfa and seaweed have also been added to provide vitamins and antioxidants to help keep your dog healthy on the inside too. Extracts of yucca and chicory encourage beneficial intestinal bacteria, reduce stool odours and enable your dog to absorb maximum nourishment from this food. No artificial colours, flavours or preservatives have been added because James Wellbeloved believe that natural goodness tastes best!